And so Sachli Gholamalizad sets in motion her show which examines the conflict between herself and her mother. 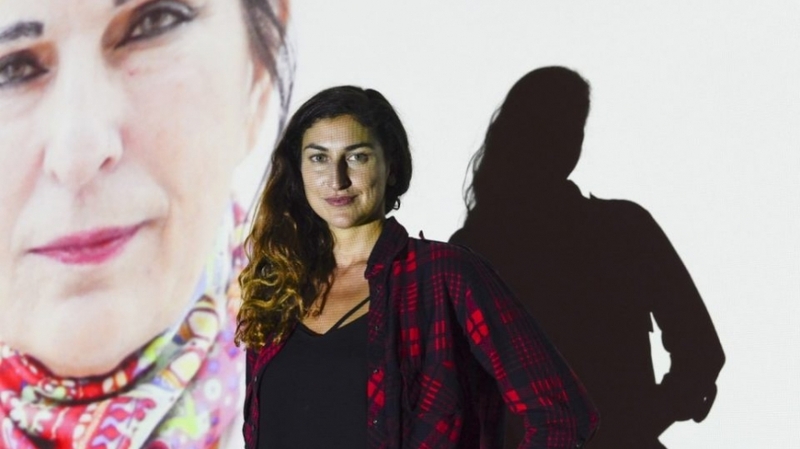 A Belgian actor of Iranian descent, Gholamalizad’s show tries to make sense of the impact that enforced migration and clashes of different cultural values has had on her relationship with her mother. The sexually explicit conversation is an overt example of those different attitudes. But given that her parents left their homeland in difficult circumstances to provide a better life and freedom for their children, her ability to be that woman is arguably a consequence of her parents’ decisions. But the daughter is angry. She wants to know more about the decisions made and seems to hold her mother accountable. The skillful interweaving of typed diary extracts/thoughts with pictures and filmed interviews with her mother and grandmother are deftly managed by Gholamalizad who is a sort of digital conductor, sitting managing the show with her back to the audience. I’m not sure whether to refer to Gholamalizad as playing a character or herself in this production as it’s intensely personal but there’s a dissonance between her and the audience because of the technology used which delineates it as a show. Several screens offer different perspectives to this narrative. Her typing appears overhead with feed of her interspersed throughout the show; other screens display film footage and a monitor alongside her allows us to see a continuous feed of her face. Strangely, having her back to the audience but facing a camera means she is able to ‘look’ at and make eye contact with the whole audience in a way that she couldn’t as a single actor onstage. The physical barriers created through the technology are interesting and amplify the emotional barriers explored by the show. The film with her mother was for me, and my Mum, the central element. Gholamalizad wants answers from her mother. The conflict in their relationship seems to stem from the family’s hurried leaving Iran and their comfortable home and life in the 1980s, when war and the political situation made her parents deem the country an unsafe place to raise their children. The film feels like an interrogation at times: her mother is framed in a close up and speaks to an unseen Gholamalizad, trying her best to answer her questions. She variously accuses her mother of hiding behind lies and being unavailable to her. She wants to know why her mother didn’t tell her and her brother the truth about why they’d left. It’s hard to watch. You can see the sadness in her mother’s flat eyes. The daughter is angry. But she’s also scared and afraid. However, she can only admit this through the filter of the typed word – she can’t said it aloud. I haven’t seen a show like this before but I think that the multimedia approach adds to the poignancy of the conflict between mother and daughter, between different cultures and different generations. Film of Sachli visiting a seaside home in Iran become more pertinent later when you realise she’s found that mythic family home left in a hurry so long ago. As I’m of dual British-Iranian heritage, I felt some resonance with my own family. The family photos Sachli holds up to the camera as the audience are seated were bizarrely familiar: the 1970’s and 1980’s fashions; the classic moustaches and sideburns favoured by Iranian men at the time; the interior (headscarves off, maybe bare arms on display) and exterior (headscarves on, not a hair escaping) family shots – it was all so recognisable. But I never had to experience the utter sadness and dislocation of Gholamalizad and her family as my parents settled here (made easier as my Mum is a British citizen). But as a daughter with a mixed cultural background I recognised some of the conflicts and the sense of a lost mythical homeland, impossible to return to. The show was skillfully woven with a variety of audio-visual elements and a real core of emotional wrangling and sadness. You don’t need a Shakespearean soliloquy to lay yourself bare onstage – Gholamalizad does that through the use of this unique approach – all with her back to the audience.